Lacey runs the local radio station in Marietta. After a nomadic childhood she's happy she's finally found a home. She lives with her great aunts who run a guesthouse and are professional bakers. Lacey is helping with the local bachelor Bake-Off, an event to raise money for charity. She films the contestants. Lacey's brother is supposed to be one of them, but last minute obligations are forcing her to find a replacement, the best option is their new guest Zac, but will he say yes? Zac prefers the anonymity of large cities. He doesn't like small town life, because it's too intimate. When he meets Lacey he's intrigued and before he knows it he's saying yes when he means no and is part of the bachelor Bake-Off. Zac has no baking experience and the baking gene seems to have passed Lacey, so he challenges her to do a contest of their own. Who is going to win and what will happen when Lacey and Zac spend a lot of time together? Baking for Keeps is a fun romantic story. Lacey used to travel all the time and is now never going anywhere again. Her life is a little too safe and she could use a challenge. The silent and distant Zac definitely provides one, he isn't an easy man to defrost. The lovely gentle man Zac, however, has his reasons to stay away from others and I kept hoping he'd loosen up a little. There are plenty of sparks between them and their easy friendship was great to read about. I especially enjoyed witnessing their time in the kitchen, it isn't always a succes, but that makes the story even sweeter. Jessica Gilmore's heartwarming writing style made me fall in love with Baking for Keeps straight away. The main characters are both kindhearted and wonderful. Marietta suits them and I loved reading about the vibrant small town. There's always something going on and people are there for each other, I liked that community spirit very much. Especially since it's being combined with a delicious story about finding the one. Baking for Keeps is sweet, tasty and endearing. Nat is in Marietta to spend time with his family. He's a singer-songwriter and is used to traveling. He's about to launch a new album, but is a bit fed up with the fake lifestyle that comes with the promotion. When he meets his high school sweetheart Linnea he's glad he's made the decision to take some time off. Linnea is a widow and has two daughters. She recently moved back to Marietta to look after her parents. Will she and her daughters be able to settle in her old hometown? Nat tries to spend as much time with Linnea and her daughters as possible. He isn't supposed to stay in Marietta though, so how much of a future would there be in dating the only woman he's ever loved? Is he just a holiday fling for Linnea or is there a chance they could be more? Will there be room in her busy schedule for someone who doesn't know if he'd ever be able to put down roots? 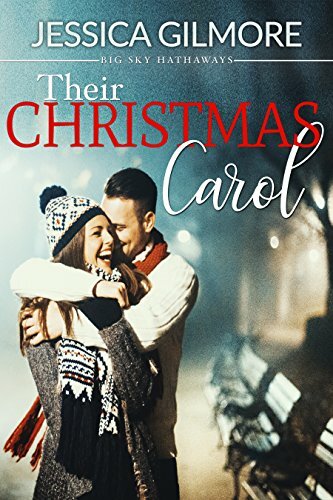 Their Christmas Carol is an amazing romantic story. Linnea is struggling, she has to raise her daughters on her own, she has a lot of work to do trying to save the family business and she's organizing a huge concert. Nat is a good musician, so he's able to help her with the music. I loved how it brings them closer together. He's also great with Linnea's kids and his overall sweetness warmed my heart. Linnea doesn't easily open up, she's a perfectionist and I kept hoping she'd be able to let go every now and then. She and Nat are a perfect match and I couldn't wait to find out if they could overcome their differences. Marietta is a fantastic setting for a festive Christmas story. I enjoyed reading about the cozy little town and its inhabitants again. It's the perfect place for broken hearts to be mended. There's always some kind of heartwarming event going on and people are kind and generous. That's exactly what a good holiday story needs. Jessica Gilmore combines this with true love and wonderful friendship and the result is a terrific lighthearted and joyous story. The Big Sky Hathaways stories can easily be read as standalones, but if you want to have all the details I'd advise you to read them in their correct order. Both of these books sound wonderful. I will have to check them out. Thanks for the reviews. Baking and indie radio, two of my favorite things! Thanks for sharing! I think it will be interesting to read such books. I like reading such love stories, sitting in rocking chair near the fireplace. After looking through the australian essay writing service reviews i made interesting conclusion. When it comes to meet new people, to like him or her, or love...It could be quite dificult say them goodbye, especially after years of being together. Love great romantic books.Their Christmas Carol and Baking for Keeps are books I will really enjoy reading especially at this time of the year. Both these books sound great. I love the idea of running a guesthouse. Baking for keeps sounds like a fun story.